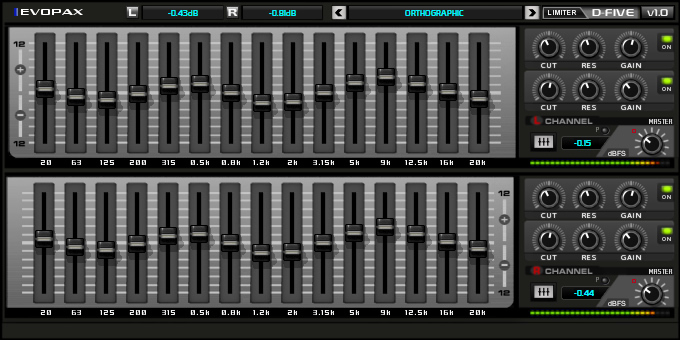 D-Five has five different panels mixing parametric, graphic sections and dynamic control with configurable envelope follower, all in the same plug-in. Also peak warning, clip function and a dBFS meter according to a well known standard. Fifteen graphic sliders and two parametric in each channel. Bundled dynamic control with envelope follower. SSE versions included in the installation file. Animated sliders. This option permits to setup with ease the stereo image. Selective Q, and switch to save CPU resources in the parametric sections. Contemporary algorithm for a better analog emulation.